West Windsor, N.J. – Your next good read is just a page turn away! The latest edition of Kelsey Review, a literary arts journal of community writers produced by Mercer County Community College (MCCC), is now available at local libraries and online. Now in its 37th year, Kelsey Review shares the fiction, creative non-fiction, poetry and photography of artists who live or work in Mercer County. Though the publication went through a period of online release only, the 2018 edition marks the second consecutive year the Review is back in print, thanks to the support of the Mercer County Cultural and Heritage Commission. According to Editor and MCCC Associate Professor of English Jacqueline Vogtman, the stories in Kelsey Review are loaded with love and positivity. “These pages attest to the fact that we in the Mercer County arts community are lucky to possess a powerful tool to combat hate: literature, which is a form of love,” she said. 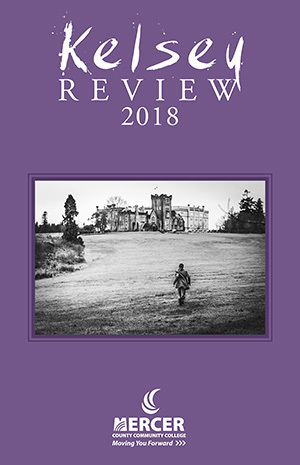 Works by 22 contributors are featured in this year’s Kelsey Review, including poets Vida Chu, Lauren Fedorko, Ivana Vranjes Field, Lois Marie Harrod, Lavinia Kumar, Lauralee Leonard, Edith McGowan, Carolyn Phillips, Wanda Praisner, Steve Smith and Ayesha Sultana. Fiction authors include Nancy Demme, Sharri Steen, Laura Tahir and Tim Waldron. Creative non-fiction pieces are by Allen Appel, Ilene Dube, Marion Pollack, Judith Salcewicz and D.E. Steward. Photographs of Fedorko, Jessie Liang and Michael Torres are also featured. The cover photograph, entitled “Magic Will Set You Free,” is by Ivana Vranjes Field, an alumna of The College of New Jersey (who also contributed a poem). Kelsey Review editors included Vogtman, Roberta Clipper (fiction), Luray Gross (poetry) and Ellen Jacko (poetry). Among the writers with strong local ties is Ilene Dube, who has covered the arts scene in Mercer County for decades, originally with The Princeton Packet and then with the public media network WHYY. Non-fiction author Barbara Krasner has taught English and history courses as a member of MCCC's adjunct faculty. Kelsey Review is accepting submissions for the 2019 edition through May 31. Each year, six of the accepted contributors are also nominated for the Pushcart Prize, a national collection of short stories, poems and essays from the small press. For more information or to read the current issue online visit the Kelsey Review’s website.